For starters the lack of plastic typically means more parts are made of metal which is more durable and strong. One additional benefit to brewing coffee in devices that don’t use plastic is that they are simply safer to use. There are many BPA free coffee makers but if you choose one that doesn’t contain plastic at all then that’s GOT to be better! In my home I have one ceramic coffee dripper, the V60 ceramic which is almost always thought of as one of the best in the category and I have nothing but good things to say about it. I also keep a Chemex in the pantry that I pull out on occasion and that never fails to make good coffee too. It’s usually used for making coffee for myself and at least one guest but they do make smaller versions to which are fine for single servings. These days though there are lots of options for making coffee without using plastic so below I’ve listed some of the best options and provided short reviews for each product. I hope you’ll find this list helpful. As I said there are lots of ways to make coffee with plastic free devices. In fact you can spend a lot on fancy plastic free coffee makers or spend very little! Below I’ve included options for people of all budgets and for people looking to make a batch of coffee or just a single cup. Let’s start the list with the BitElegant French Press Coffee Maker. This 34 ounce model is one of the coolest models that you might get the chance to pick up. Besides its classy design, its look is also taken to the next level because of the stainless steel body. 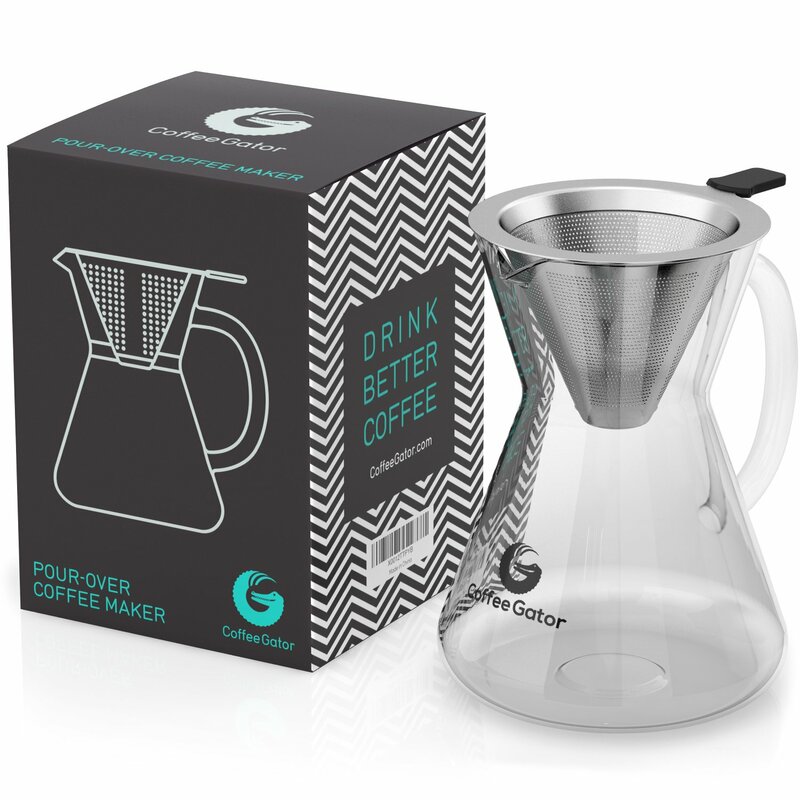 This model is made into the perfect French press by its perfect micro-filtration system, ensuring that you’ll never get any sediment in your coffee. The heat resistant borosilicate glass beaker makes this model the perfect one for your kitchen, because of it’s seemingly eternal durability. While this model might appear slightly expensive, you can always be on the lookout for deals! 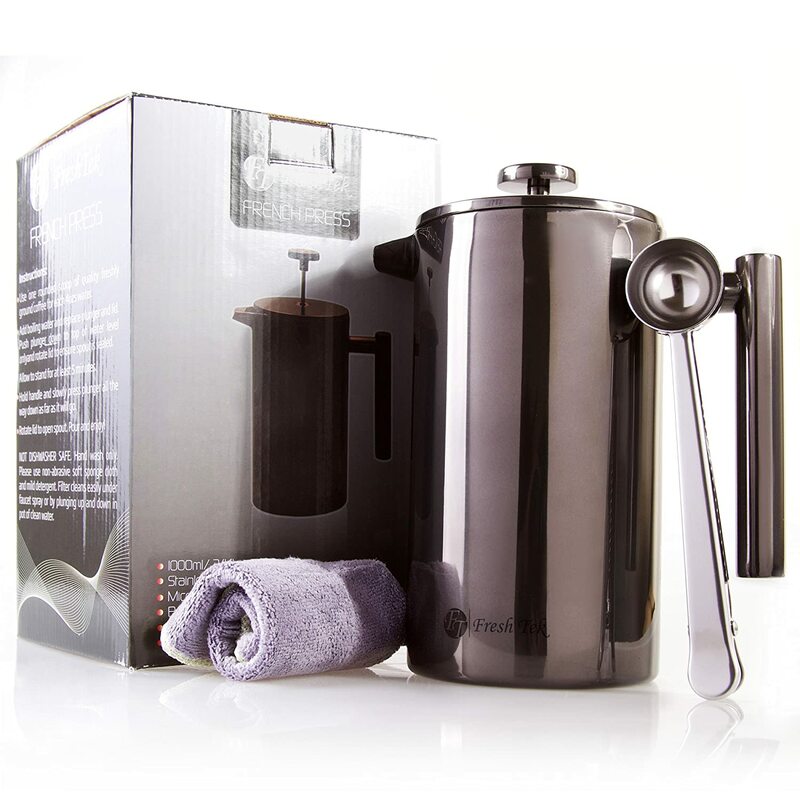 Now, the model that FreshTek offers you is also a 34-ounce French press coffee maker. While the last model was using glass, which does have shattering potential, the body of this model is made of stainless steel, which hurts its innate heat retention, but that’s made up for by double wall insulation! Let’s come to a model that’s much simpler now. 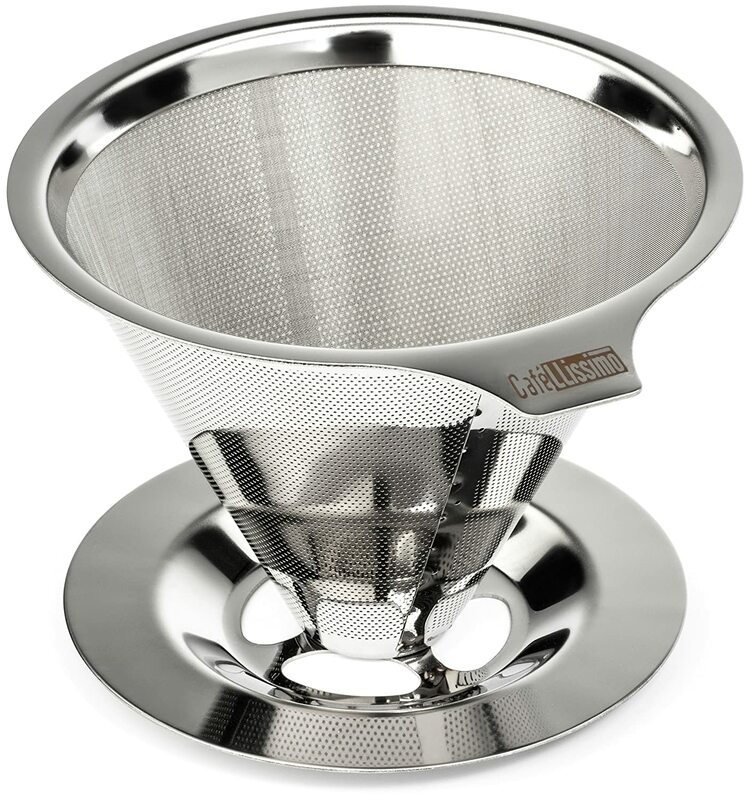 This is the Coffee Gator Pour Over Coffee Maker. As you can see from the adjoined picture, this model literally doesn’t need any plastic, at all! It’s a simple design, so it’s not like some important part has been compromised and that’s a great thing. Some people believe that this is the right way to make coffee- by dropping water at the right temperature over the beans for the right period of time. If you’re one of those people, then this is exactly the model for you. 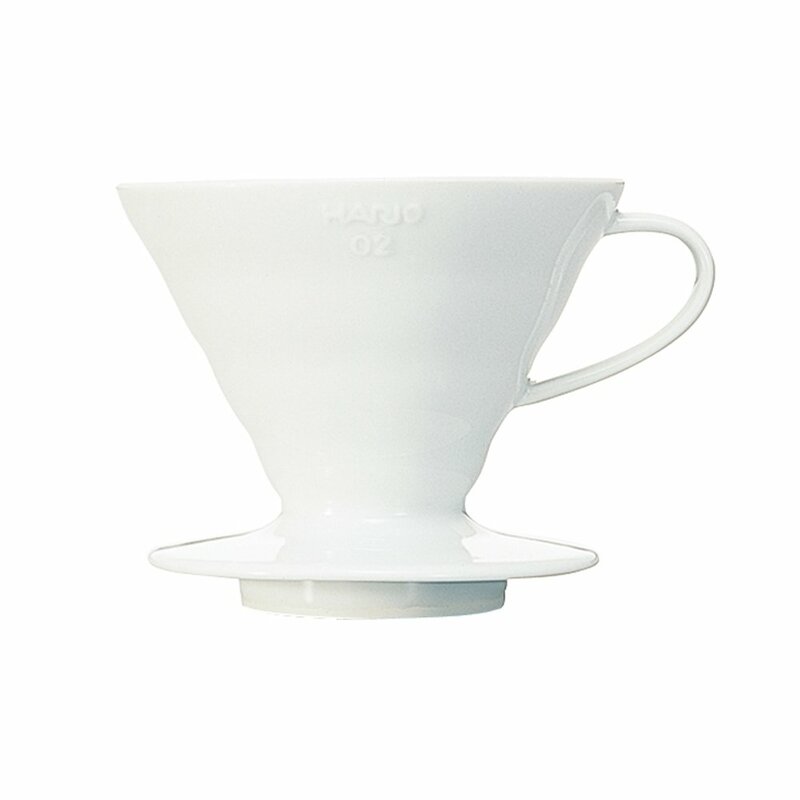 Then comes the Hario V60 Ceramic Coffee Dripper. In Japanese, Hario means “The King of Glass”. You can understand the quality of this model from that, can’t you? This option is one of the simplest models to use and it has one of the simplest designs, making it a great choice to go for. So, you’re getting something that’s free of plastic without having to compromise on anything at all. 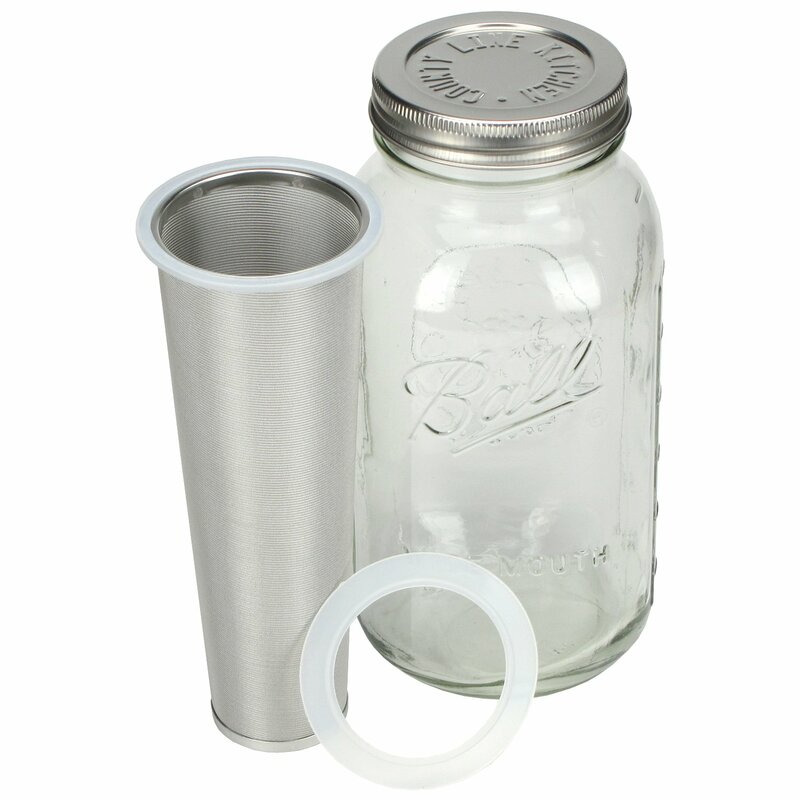 Let’s conclude the list with the Cold Brew Mason Jar Coffee Maker. 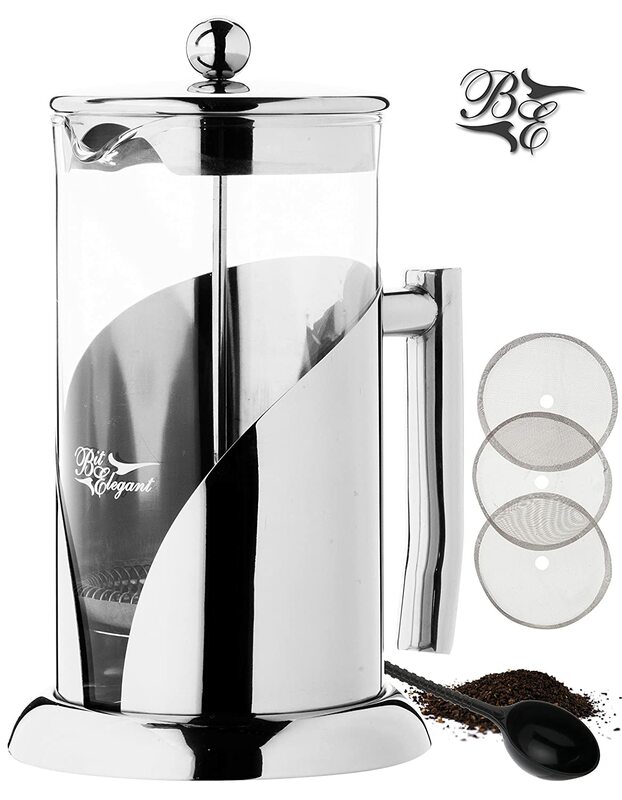 This 2 quart model is actually one of the best filtered Jar Coffee makers with a stainless steel filter that makes it super durable at the same time- proving that it’s going to be worth your money in the long run. Even cleaning up this model is quick and simple and all the parts are dishwasher safe, making it super relaxing to just make your coffee and have a sip, without having to worry about going through a hassle just to clean it. One of the models I’d really recommend. Now, of course, we haven’t listed these models of all others just because we liked them. Several factors have been kept in mind, while sorting for the best model that might be able to serve you the best. So, it’s really important that you get to know about these factors, so you might judge for yourself. This can only further ensure the chances of you getting the model that would, once again, serve you the best. First of all, the capacity of the model has been kept in mind. This is one of the properties which must always be kept in mind, because it directly depends on what you’re looking for. As in, if you’re looking for a 2-liter model, neither a 1-liter model, nor a 10-liter model would be a really great choice for you. Next, aesthetics has also received consideration because that’s important to a lot of people. You don’t want to ruin the look of your whole kitchen because of something you didn’t properly consider, right? So we’ve done the hard work for you and chosen the models that would fit your kitchen, beautifully. Next, there is the factor of specialty. Some models are made for specific cases, such as the dripper models we mentioned in our list. In such a case, once again, your needs come into consideration. If you’re looking for something like that, then that must be a good thing to go for because special models are mostly unique. The financial aspect is always important. We understand that some people might be on a conservative budget, too. So we’ve kept that in mind and we hope that you’ll be able to find the right model for yourself here regardless of your budget. And, of course, reviews from customers are a direct source of knowledge about the product without the hype. If they liked it, then that’s the greatest evidence that it’s a good product from a general perspective. That has also been taken note of to ensure that you get the best product. Now, as I just stated, all these facts have been kept in mind while we compared the models that are available in the market. Gradually shortening down the list, we narrowed it all down to these few choices and now, here we are, presenting these choices before you to save you all this work so that you can find the best model for yourself with ease! Just keep in mind that you still have to judge them according to your specific needs in order to find the one that would be the best for you. That’s the only way to find the best model for yourself! Now, there might be a lot of questions that you might want to ask me at this point. I understand and I assure you that it’s perfectly alright and that I’m here to answer all your questions as the host for your article.Since you cannot exactly ask me questions right now, I’m just going to answer the most commonly asked questions at this point. However, I understand that you might have something other than that to ask as well and I fully respect that. I’d love to hear about your concerns and to brainstorm over the perfect solution with you. So, please do not hesitate to reach out to me so that we can discuss anything together that you might deem as in need of discussion! Why would I want to use a model that does not have any plastic parts? As I said earlier, there are a whole lot of reasons why you might want to do that. This might be because of the durability, it might be because of safety purposes, or it might be just a new trend- to each his own. And we entirely respect any reason that you might have. Are these models functionally the same? These models are actually just the same things with parts made of something else. While there are some models that might provide you with a slightly different functionality, most of them are just the same as their plastic-using counterparts. Is it worth spending more for one of these models? Well, most of these models tend to be more durable than the plastic models. So, while it might seem like a slightly larger investment at first, it might as well pay for itself in the long run. Of course, this is pretty much case specific and luck dependent, but if your stars are with you, you might just make a profit, despite a higher initial investment. How much should I spend on a model like this? This is entirely dependent on your budget. Since we are looking at it from a general perspective, it’s something we cannot exactly discuss here. But you should always keep your budget in mind and buy the model that fits in perfectly. Should your budget be a hundred dollars, neither a ten dollar model, nor a two hundred dollar model may be the right one for you, but at the end of the day, you must judge the model according to functionality and just see if the right one fits your budget or not. At the end of the day, we’ve listed and discussed the models that are available, but from our place, we can only do that on a general basis. You must understand that your specific needs are only perfectly clear to you. That makes it even more important for you to know them perfectly and to judge every model according to them since that’s the only way to find the best model for you. You must keep in mind that the best model for you isn’t always the best one available out there. The best model for you is the one that serves all your specific needs at the most affordable price and that’s one of the things that you simply must keep in mind when you go out looking for the right product for yourself. Finally, do know that Gamble Bay Coffee is here for you. We here at Gamble Bay Coffee try our best to bring you the right information to help you find the products that are the best for you. We hope that you could learn at least something new from your article that would help you do the same. Stay tuned for more great articles such as this one! Is French Press Coffee Similar to Keurig?